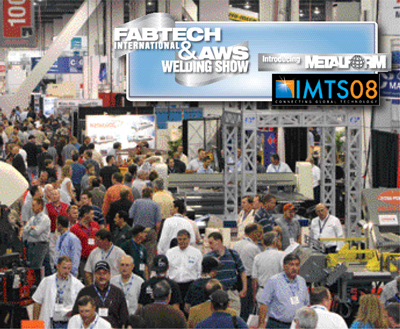 FABTECH & AWS Welding Show introducing METALFORM, recently treated tens of thousands of attendees to the latest and greatest products and services for metalformers, fabricators and tool designers and builders. MetalForming’s editors were there to chronicle what’s new. Here we present some of those new products. Look for plenty more in future issues of MetalForming. 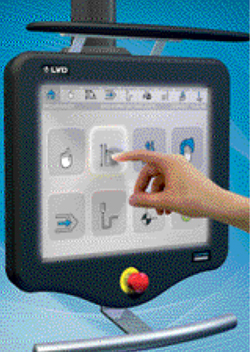 monitoring of all laser- and waterjet-cutting processes. A module to Bystronic’s Bysoft software, it automatically acquires data from a company’s ERP system and part geometry from the CAD program and produces optimized cutting plans. It then groups the part-production plans to optimize workflow and cutting-machine scheduling. PMC, explained Bystronic officials, permits metalformers with a large volume of cut parts or that process a large variety of materials and parts to improve their productivity while providing immediate real-time access to production and machine data. Bystar modular laser-cutting machines (shown) cut flat sheet and plate as well as tubes and formed profiles. Material-thickness capacity is 1 in. in mild steel. Strippit LVD introduced the FABTECH crowd to its LP-1225 laser-punch combination machine. The machine combines the firm’s latest hydraulic punch press and Fanuc’s fast-axial-flow CO2 laser technology. bending programs using the control, and were able to rapidly go from drawing to completed part program. The control works with LVD’s integrated bending database and on-board 3D bending software to create and store user-generated databases for bend allowance, angle correction and springback. These databases then are searched and applied each time a part program is generated, enabling the control to learn the optimal bending parameters for the given environment. Weldcraft introduced at FABTECH its newest addition to the Legacy series of gas-tungsten-arc-welding torches—the LS17 air-cooled torch—which features an innovative torch-handle design that is says improves welder comfort, control and productivity. It’s rated at 150 A DC and 125 A AC. The unique, flexible knuckle joint at the base of the torch handle permits greater torch control and easier movement, say company officials, while also minimizing stress on the power cables and on the back end of the torch body. A styled soft-grip handle adds to operator comfort and prevents slipping to improve overall torch control. The torch is available with a 12.5- or 25-ft. single-piece rubber cable assembly. Syncrono 2D laser-cutting systemPrima North America, Inc., Chicopee, MA, demonstrated the Syncrono 2D laser-cutting system at FABTECH. The system was outfitted with Prima’s new CV5000 laser resonator and new, compact CompactServer automatic material-handling system. CompactServer requires no extra floorspace beyond that for the laser cutter, allowing the Syncrono, with a working area of 60 by 120 in., to become an independent, unmanned workcell. 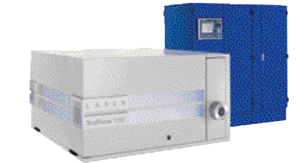 The CV5000 laser resonator provides exceptionally high cutting speeds for increased productivity, and the ability to process thicker materials and produce superior cut quality with a reduced heat-effected zone, all while consuming less power and lowering operating costs as compared to previously used similarly powered laser resonators, according to company officials. The system’s patented laser head, with two additional small, linear-driven parallel kinematic axes on the moving gantry, allow the cutting head to cut at an acceleration of as much as 6 g. That enables the Syncrono to cut more than 1000 holes/min. The CompactServer consumes no floorspace owing to its components being located over the automatic pallet changer. This integrated approach allows the system to be transported without disassembling it, and installation is simplified because no foundations are required. Two open and accessible shelves on the material handler simplify loading and unloading of raw and finished sheetmetal stacks. So much metal-fabricating equipment seems to be getting more powerful and yet smaller in size and lighter in weight, and manual plasma-arc-cutting machines represent good examples of this. Such is the case for plasma-cutting machine manufacturer Hypertherm, which showcased its Powermax45 portable power supply. The unit, rated for a maximum output current of 45 A, can cut mild steel to ¾ in., yet it weighs a mere 37 lb. and measures a svelte 16.75 by 6.75 by 13.7 in. Also on display was the HyPerformance HPR400XD 400-A power supply for mechanized precision cutting. Dubbed by booth attendees as the next generation of HyPerformance plasma, the unit includes the firm’s PowerPierce technology (use of a liquid-cooled gas shield) that dramatically improves (by 25 percent, reportedly) piercing capacity compared to other similarly-rated machines on the market. The process minimizes dross adhesion to the shield, particularly when cutting thick material, which can clog the vent holes and affect consumable life and cut quality. It can cut mild steel from 0.5 to 80 mm thick. with one abrasive-jet cutting head, and a second cutting head can be added to increase productivity. Ball-screw-driven for higher accuracy, it boasts a heavy-wall tubular-steel construction that eliminates vibration and increases machine longevity. The waterjet machine uses an industrial PC controller and can be configured so that all three axes are fully programmable, and it also features direct-couple AC brushless digital servo motors and single or double carriages. 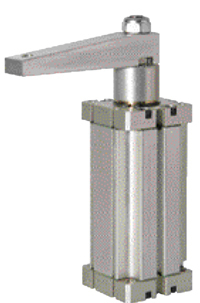 Critical bearing components are protected with heavy metal covers with flexible lip seals. 1.18 in. thick and aluminum to 0.8 in. thick. Cutting-speed increases of as much as 10 percent can be achieved for stainless steel 0.312 through 0.625 in. thick, and to 30 percent for 0.75- to 1-in.-thick stainless. In some aluminum applications, cutting speeds may increase by as much as 10 percent. for secondary manufacturing operations including welding and assembly. Also on display: carbon-fiber-reinforced plastic booms for robotic applications. The booms feature a modern design that uses the latest materials and technologies to reduce weight and deflection, and mount to a family of standard and application-driven platforms. Fanuc Robotics America Inc., Rochester Hills, MI, used the IMTS stage to roll out its behemoth M-2000iA super-heavy-duty robot. Designed to meet customer requirements for handling truck, tractor, and automotive frames and parts, the robot offers a 900-kg payload. The robot’s rigid arm design features a vertical lifting stroke of 6.2 m for transferring extremely heavy items such as a car body. A second model in the super-heavy-duty robot series, the M-2000iA/1200, can support a 1200-kg payload with a 1.25-m offset from the faceplate and full articulated motion at the wrist. The strongest power for all six axes enables a single M-2000iA/1200 robot to handle a heavy part that previously would have required dual robots, according to Fanuc officials. The M-2000iA operates with Fanuc’s latest R-30iA controller featuring integrated intelligent functions such as vision and force sensing. At IMTS, the M-2000iA/900L was set up to position a tractor frame near a Fanuc R-2000iB/165F robot. The R-2000iB, equipped with iRVision 3DL, picks randomly piled brackets and places them on the tractor frame, with power clamps holding the brackets in place. The M-2000iA/900L then positions the tractor frame near two quad-arm Arc Mate robots to simulate a coordinated welding sequence to weld the brackets to the frame. Upon completion of the weld cycle, all of the robots demonstrate envelope or coordination paths. Finally, the R-2000iB robot returns the brackets to the pick station and the cycle repeats itself. Production monitoring and delivery of process data from the plant floor to the corner office continues to take on an increased role as manufacturers look to optimize throughput and quality, and provide job-status reports to their customers. For its part, Lincoln Electric officially released the newest version of its Production Monitoring software, version 2.0, which enables remote review of critical weld data from the shop floor, the executive office or on the road. The software grabs data from any networked Lincoln Electric Power Wave power source so that engineers and executives can stay connected with the shop floor from anywhere in the world. In addition to monitoring weld data, it allows for storing and sharing of files, monitoring production tasks, setting welding-process limits and tolerances, and tracking consumable inventory. Welding-machine faults also can be logged and e-mailed, while diagnostic troubleshooting can be performed from a remote location. New with version 2.0: a web browser-based user interface, and a new data-management system through Microsoft SQL server express. 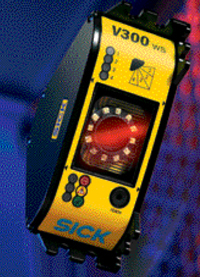 The V300 WS safe camera system from SICK, Inc., Minneapolis, MN, a compact safety device ideal for hand protection, reportedly is the first device of its type for Category 3 protection of hazardous points-of-operation in compliance with EN 61496-1 (SIL2 according to IEC 61508). 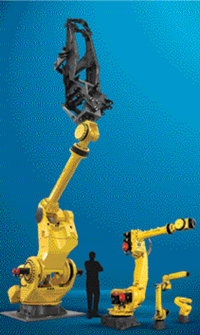 Applications include access openings on assembly, handling and industrial robots, inspection machines, and other manually operated workstations involving occasional access. The V300 WS, debuting at FABTECH, is based on image-processing technology. The sensor’s illumination and receiver is integrated in the compact, triangular housing that allows mounting in or on the corner of a workstation’s frame. Reflective tape, attached on the opposite sides of the mounting location, relays the illumination. With its 110-deg. angle of view, the camera system automatically detects the entire length and breadth of the reflector area and aligns the monitoring field with a resolution of 20 mm. The system responds within 20 ms if anyone reaches into the machine while it is running, and sends a stop command to the machine. See also: Bystronic Inc., FANUC America, Inc., Hypertherm, Inc., Jet Edge Waterjet Systems, Lincoln Electric Co., Prima Electro North America, LLC, SICK, Inc., TRUMPF Inc., Weldcraft, LVD-Strippit, Inc.